I wear my hat so low, I swear my eyelashes might touch it. Good to know that I have career options at ski resorts available to me. 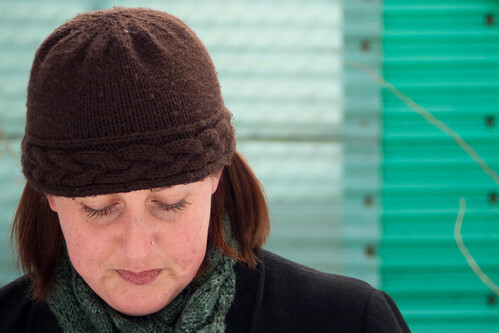 i knit a coronet from DB Cashmerino Aran as well, but i gifted it (yikes!) and don't know how it wears now... i have knit a simple cabled hat and a matching set of fingerless mitts and they're wearing well enough. like you said, it is very soft. and for a hat, really, it's fabulous. i'll be on the watch for which yarn you select for your next coronet. maybe i'll have to copy. I loved my coronet... I lost it at a concert. I should make another one. I love how it keeps ears so warm. It's beautiful, too bad it pills so badly. This hat has been in my queue for a long time. Maybe it'll be next after I finish my family of thorpes! i always wear my hat low too - even lower than my eyebrows! I guess I hang out with too many ski resort employees...but I always wear my hat low as I want to make sure it's covering my ears - very importing when boarding down a slope in the wind! You're right about the low-brow thing. Although Bubba swears this is a knuckle-dragger trait rather than a two-planker trait. At least I can walk into the lodge for my noon beer without ker-klunking the crap out of myself. Love those boots. nice!! i love wearing my hats low also. i'm glad you can get good use out of it. Love that pattern -- it looks like you made it so that the bottom doesn't roll up -- that's how I did it (actually cause I didn't follow the pattern correctly). I think it's a little more streamlined without the roll-up (personal preference). And yes -- we all still wear our hats low on the forehead -- at 10 below yesterday in Maine -- we need all the coverage we can get! I knit my coronet in Dream in Colour Classy and it's being used intensly in North France (we had up to -12°C last week). Anyway, just a heads up to say it's very warm and seems to be wearing well. It's a quick knit, you'll soon have a new one! It does look great on you! I'm all about hats these days! Even pilly, the color is perfect. It's still pretty, I like that cable! really nice! adorable on you!